Brad Parker is a recording artist, songwriter, producer and musician. Parker’s music has earned him numerous awards in countries around the world with sales in the millions. In America his hit Country song “Nobody’s Gonna Rain On Our Parade,” recorded by Kathy Mattea, earned him BMI awards as a songwriter and a publisher as well as a BMI “Million-airs” citation for over 1 million broadcast performances in 1996. Parker’s recordings as an artist with “the NOBS,” produced by David Kahne, earned two hits on college radio in the 1980’s. Cher has recorded his songs as well as Richard Page, Edgar Winter, Karla Bonoff, K.T. Oslin, Ronny Cox, Kieran Goss, Andrew Gold, Hurricane, Rick Vincent, Wendy Waldman, Bill Miller and many others. 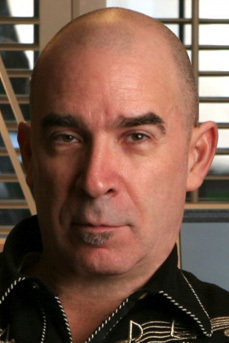 Parker has produced and written hits for artists around the world including Andy Lau and Ekin Cheng in Hong Kong, M. Nasir in Malaysia, Jaya in the Philippines, Eleanor McEvoy and Kieran Goss in Ireland. Parker was Vice-President of the National Academy of Songwriters as well as a co-founder of the “Western Beat” and “Songfarmers” songwriter showcases in Los Angeles in the 1990’s. Brad has shared the stage with Bo Diddley, Cyndi Lauper, Michael Bolton, Brenda Russell, Billy Burnette, Canned Heat, John Densmore, Greg Allman, Johnny Rivers, Eddie Money, Dan Fogelberg and Robert Cray. Parker has co-written songs with many songwriters for over three decades including Barry Mann, Paul Williams, Franne Golde, Wendy Waldman, Eric Kaz, Phil Galdston, Will Rambeaux and Allan Rich. In 2000, Parker launched Indie label Riozen records with a release of his record “moonology” as well as a Christmas single, “Christmas Card,” performed with acclaimed Irish singer/songwriter Eleanor McEvoy and recorded in Dublin, Ireland. In 2012 he released his latest album, “Days Of Poetry.” Brad has published two books, “Left Turn Only: Dispatches From The Progressive Underground,” and “One Hundred Days Of Poetry” in paperback and as eBooks. You can find them on Scribd, Amazon, iBooks, Kindle etc. Brad is a 28-year member of NARAS and co-founder of online music marketing and promotion service “www.muzlink.com.” Brad is a prolific political, social and cultural writer and speaker. Parker has worked extensively on copyright and Net Neutrality issues. Brad’s website is: www.riozen.com. Brad grew up in Iowa, New Mexico and Texas, where he attended the University of Texas in Austin.